Is it really Maj. Golightly? Of course. He can not be imitated. Others have congratulated me on the new banner across the top of the blog. But the comment that means the most to me comes from Maj. Bertram "Bunty" Golightly. Maj. Golightly is almost certainly fictitious, despite "his" denials. If he's real, he must be mad — or, at least, madcap. He's a bigot, a sexist and a confirmed colonialist in the tradition of Col. Blimp. 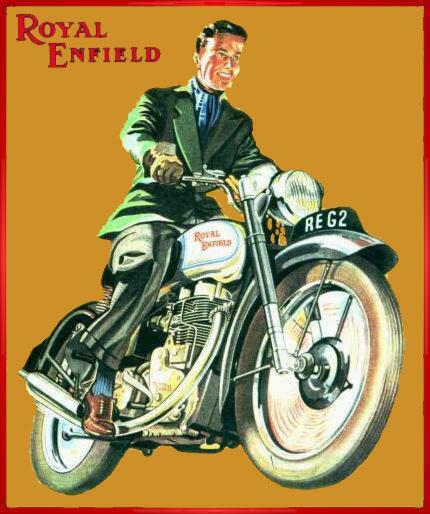 However, the major's loyalty to Royal Enfield is unchallenged. For years, he led the Royal Enfield Yahoo message group on a mad cavalry charge (mounted on Royal Enfield sidecar rig) against windmills far and wide. He still haunts Internet forums devoted to the brand. The fact is, I can find no proof of his existence outside those forums except that on one rare occasion he wrote me directly. To my knowledge, only Royal Enfield guru Pete Snidal claims to have met the major in person. Not bad Blasco, not bad at all. I think the filly has done a fine job, even managed to get the flag the right way up — don't yer know. You should give some credit to our Indian chums though — eh what? The poor blighters must be feeling quite left out, having made the ruddy bikes, haar haaaaar haaaaaaaaaar! Oh by the way, "Happy New Year." Thanking the major, you can't trust a pair of Yanks to get the Union Jack right side up — in fact, until I Googled it just now, I didn't know it could be upside down. That was just dumb luck. As for forgetting India's contribution to preserving the brand: no excuse sir! UPDATE: Check the Comments below for more from the major. Major Bunty Golightly might approve of a recent article in the Ottawa Citizen in which a defense expert imagines with tongue in cheek that Canada revive military traditions of old: "The army is to revert to Britishstyle battle dress and puttees, and the Lee-Enfield rifle that won the two world wars will be brought back into service. The RCAF will be equipped with hand-built Spitfires, bound to cost less than F-35s. And the RCN will build a brand new, perfect in every detail, HMCS Niobe, that will not go to sea but will be docked next to the navy's unusable (British-built!) submarines." thank you for pointing out the article in the Ottowa Citizen .The author is ,of course, a blithering idiot .But 'pon reflection methinks that the Canadian military could do far worse ,the battledress is a fine uniform ; unlike the ruddy " camo pyjamas" that the military seem to favour these days - Ye Gods - scruffy buggers ! Gaiters and not puttees would be worn with battledress though I would not expect a Canadian journo gossip monger to know that sort of thing -eh what? I feel that I should mention that the Lee Enfield No4 Mk1 is still in service in Canada and is currently being used by the Canadian Rangers - don't yer know .Just who the Canadian Rangers are and what sort of antics they get up to in the frozen North is a bloody good question ,now that the threat of invasion by our Oriental chums the "Yellow Peril " has diminished somewhat in the last 60 years ,perhaps they are having too much fun over there and don't want to stop looking for paper ballon bombs - haar haaaar haaaaaaaaar ! Furthermore the SMLE is still being used by Taliban snipers [ may they fry in hell] and remains an effective weapon for medium to long range - just so I declare .The 303 round is very similar to the 308 that is once again finding favour with the modern military . The SMLE is the finest bolt action battle rifle ever built and I will defend it's honour with my dying breath , somewhat like the Royal Enfield Bullet it refuses to die and is none the less effective after all these years, both are dear to me heart and I won't hear a word said agin 'em by God !!!!!!!!!!!!!! I have dug up a cache of SMLEs that were embalmed in cosmoline and buried beneath the rhubarb patch after the last conflict ,Bunty is expecting another visit from hostile forces [to wit -the Inland Revenue] [ the swines ] and I wish to have all the servants armed this time . anybody who refers to him as "mad"
David, thank you for your comment but no, I don't think it's Pete. The rapid-fire "tarty Triumphs" exchange between Pete and Bunty on the Royal Enfield Yahoo forum way back in the day could not have been managed by any one person not afflicted with dual personalities. I think Bunty is an original, and I enjoy bringing attention to his writing. Birdshot for me? I hope not. Could easily be a ruse to throw everyone off his trail..
You will remember that the only person who claims to actually have met the Major... is Pete Snidal.